E = High sampling variability; interpret with caution. Source: CICH graphic created using data adapted from the First Nations Regional Longitudinal Health Survey (RHS) 2008/10, National report on adults, youth and children living in First Nations Communities. https://fnigc.ca/sites/default/files/docs/first_nations_regional_health_survey_rhs_2008-10_-_national_report.pdf -accessed August 2, 2017. 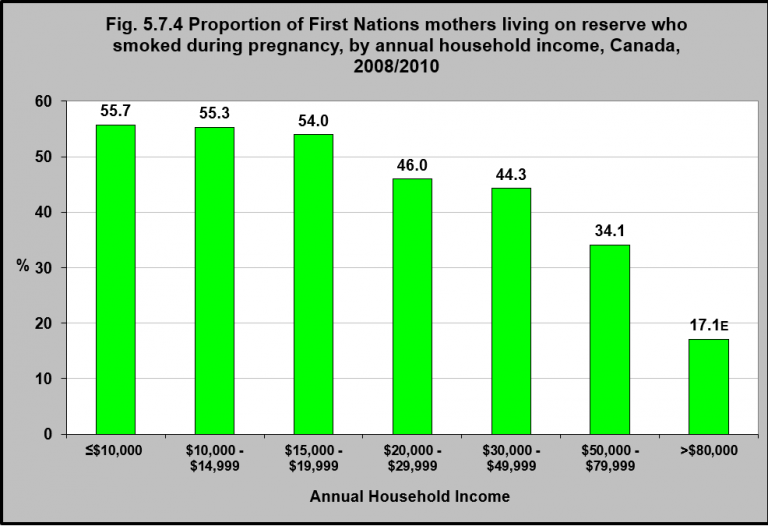 The proportion of First Nations women who smoke during pregnancy decreases as their household income increases. Among First Nations women living on reserve who lived in households with less than $10,000 annual income, 55.7% of them smoked – compared with 17% of women who lived in households with more than $80,000 income. Income is associated with educational attainment; the higher the level of education, the greater the level of income.1 As an outcome of education, income can also be considered a predictor of smoking during pregnancy, with lower levels of income associated with higher levels of maternal smoking during pregnancy. Addressing the issue of maternal smoking among Indigenous women will require a holistic approach focused on factors that can improve income of Indigenous women (such as education), together with targeted public health interventions that consider both the social reality and cultural context of Indigenous women’s lives. 1Mayer, S.E. (2010). The relationship between income inequality and inequality in schooling. Theory and Research in Education, 8(`), 5-10.